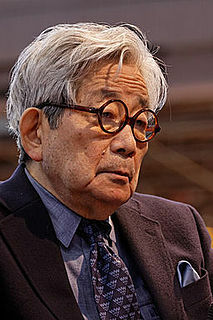 Kenzaburō Ōe is a Japanese writer and a major figure in contemporary Japanese literature. His novels, short stories and essays, strongly influenced by French and American literature and literary theory, deal with political, social and philosophical issues, including nuclear weapons, nuclear power, social non-conformism, and existentialism. Ōe was awarded the Nobel Prize in Literature in 1994 for creating "an imagined world, where life and myth condense to form a disconcerting picture of the human predicament today". The National Maritime Museum (NMM) in Greenwich, London, is a maritime museum in London. The historic buildings form part of the Maritime Greenwich World Heritage Site, and it also incorporates the Royal Observatory and 17th-century Queen's House. In 2012, Her Majesty the Queen formally approved Royal Museums Greenwich as the new overall title for the National Maritime Museum, Queen’s House, the Royal Observatory, Greenwich, and the Cutty Sark. The museum is a non-departmental public body sponsored by the Department for Culture, Media and Sport. Like other publicly funded national museums in the United Kingdom, the National Maritime Museum does not levy an admission charge, although most temporary exhibitions do incur admission charges. Greenwich is an area of southeast London, England, located 5.5 miles (8.9 km) east-southeast of Charing Cross. It is located within the Royal Borough of Greenwich, to which it lends its name. The war also figures prominently in many thousands of novels and other works of literature, including many published in the 1990s and 2000s. 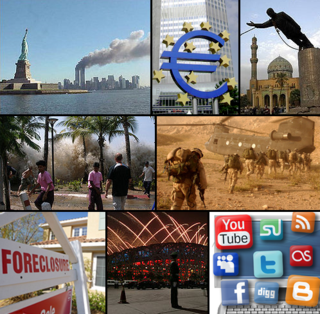 The 2000s was a decade of the Gregorian calendar that began on January 1, 2000, and ended on December 31, 2009. High Flight (1941) by John Gillespie Magee Jr. (US pilot flying with a Canadian Spitfire squadron during the Battle of Britain). Misha: A Mémoire of the Holocaust Years is a literary hoax by Misha Defonseca, first published in 1997. The book was fraudulently published as a memoir telling the supposed true story of how the author survived the Holocaust as a young Jewish girl, wandering Europe searching for her deported parents. The book sold well in several countries and was made into a movie, Survivre avec les loups, named after the claim that Misha was adopted by a pack of wolves during her journey who protected her. Watch on the Rhine is a 1943 American film drama directed by Herman Shumlin and starring Bette Davis and Paul Lukas. The screenplay by Dashiell Hammett is based on the 1941 play Watch on the Rhine by Lillian Hellman. 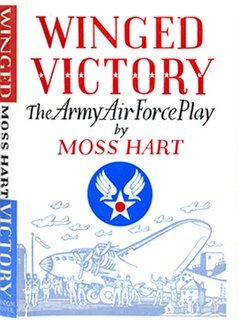 Winged Victory is a 1943 play by Moss Hart, created and produced by the U.S. Army Air Forces during World War II as a morale booster and as a fundraiser for the Army Emergency Relief Fund. Hart adapted the play for a 1944 motion picture directed by George Cukor. This Above All (1941) is a novel by Eric Knight. It was adapted into an Academy Award-winning movie in 1942. Eric Mowbray Knight was an English novelist and screenwriter, who is mainly known for his 1940 novel Lassie Come-Home, which introduced the fictional collie Lassie. He took American citizenship in 1942 shortly before his death. The Snow Goose: A Story of Dunkirk is a novella by the American author Paul Gallico. It was first published in 1940 as a short story in The Saturday Evening Post, then he expanded it to create a short novella which was first published on April 7, 1941. World War II has provided material for many films, television programmes and books, beginning during the war. 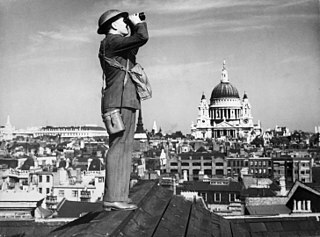 The film aspect had reached its peak by the 1960s, with films such as The Longest Day (which had been adapted from a book), The Great Escape , Patton and Battle of Britain . In the UK the actor Sir John Mills became particularly associated with war dramas, such as The Colditz Story (1954), Above Us the Waves (1955) and Ice Cold in Alex (1958), and was seen as the personification of Britain at war, conveying heroism and humility. Movies about World War II continued for the rest of the 20th century and into the 21st century, though less in number and included Schindler's List (1993 film), The boy in the Striped Pajamas (2009 film), The Thin Red Line (1998), Saving Private Ryan (1998), Flags of Our Fathers (2006) and Red Tails (2012) about the African American Air Fighter pilots of the Tuskegee Airmen. Movies and television programs about the war continued to be made into the 21st century, including the television mini-series Band of Brothers , The Pacific and Dunkirk . The majority of World War II films are portrayed from the Allied perspective (increasingly being limited to that of the Americans). Some exceptions include Das Boot , Der Untergang , Letters from Iwo Jima , Stalingrad , Joy Division , and Cross of Iron . World War II used to provide most of the material for the USA TV channel, the History Channel. Mel Brooks used the theme in the fictitious musical "Springtime for Hitler" and in his 1968 film and 2001 musical, The Producers . Many non-war-related TV shows in the USA, such as The Simpsons, South Park, Family Guy, The Looney Tunes Show and Seinfeld frequently make reference to World War II-related persons and subjects, such as Adolf Hitler, Franklin Roosevelt, battles during the war, The Holocaust and the bombings of Hiroshima and Nagasaki. During the war several Donald Duck shorts were also propaganda films. Also, some films and TV series attempt to show and educate the future generation about the horror of racism and discrimination when taken into a national frenzy by making films based on the Holocaust and other German war crimes. Movies like Schindler's List, Anne Frank: The Whole Story, Life Is Beautiful, The Devil's Arithmetic, The Pianist, The Boy in the Striped Pyjamas and many other films depict the hardship the Jews endured in Auschwitz and other concentration camps. Due to the still sensitive subject between China, Japan and Korea, the War in the Pacific and the Second Sino-Japanese War is hardly made into any historical war films intended for entertainment use in these countries. However, reference about the ongoing war as a background setting is heavily used as a setpiece to drive the storyline on. For example, Hong Kong martial arts films have used the "cartoon villain" portrayal of Japanese soldiers or generals being defeated by the Chinese lead character in an attempt to stop the Japanese from using biological weapons or stealing Chinese treasures (films like Fist of Fury , Millionaire's Express and Fist of Legend ). 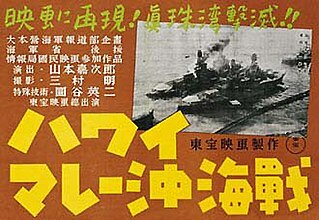 Some films that depict Japanese war crimes were also made, such as the controversial exploitation film Men Behind the Sun . More serious documentary style films have also been made such as the German made documentary Nanking . However the depiction of the Defense of Sihang Warehouse was made in 1938, one year after the actual Battle of Shanghai, probably one of the earliest Sino-Japanese war film intended for entertainment and moral boosting propaganda. Also recently, to celebrate the Chinese Red Army first victory (out of two major battles the Communists actually fought) over the Japanese, a heavy-handed propaganda film that depict the Battle of Pingxingguan was made in 2005 to commemorate the 60th anniversary. However it was heavily criticised by the government of Taiwan, accusing the PRC government for hiding the truth by discrediting the Nationalist Revolutionary Army who took the brunt of the battles as it was they who did most of the fighting against the invaders in more than twenty battles. Actually, the PRC has made several films focusing on battles fought by Nationalist soldiers, such as the Battle of Taierzhuang and Battle of Kunlun Pass. World War II has also been replicated through miniatures tabletop wargaming. Games like Flames of War , Command Decision, Spearhead, BlitzkriegCommander and others have become popular among historical miniature wargamers. A novelty is the upcoming of free internet based wargames in high quality such as Final Round . One relatively new development of the "World War II media franchise" is that of video games. They are an extremely lucrative aspect of the gaming industry, and many titles are usually released every year. Some established games series about World War II include Battlefield 1942 , Medal of Honor , Call of Duty , Close Combat , Day of Defeat , Day of Defeat: Source , Brothers in Arms , Wolfenstein 3D , arguably the highest acclaimed Submarine simulator franchise so far - Silent Hunter , the Commandos series, as well as the grand strategy game Hearts of Iron II . An RTS game was released based on America's western campaign called Company of Heroes . In 2001, a massively multiplayer online game MMORG World War II Online was introduced, and has thousands of players refighting the 1940 Western Europe campaign. There are however also much older games about the war, the arcade game 1942 being one of many examples. Poetry: "the Cranes" by the renowned Dagestani poet Rasul Gamzatov, "Wait for me"  by Konstantin Simonov, "I am Goya"  by Andrei Voznesensky, "It has snowed for three days" by Mustai Karim  (a Bashkir poet). World War II reenactments mainly reenact the military personal of the Allied powers or Axis powers. 1 2 Onishi, Norimitsu. "Japanese Court Rejects Defamation Lawsuit Against Nobel Laureate," New York Times. March 29, 2008. The 1940s was a decade of the Gregorian calendar that began on January 1, 1940, and ended on December 31, 1949. The European Theater of Operations, United States Army (ETOUSA) was a United States Army formation which directed US Army operations in parts of Europe from 1942 to 1945. It referred to Army Ground Forces, United States Army Air Forces, and Army Service Forces operations north of Italy and the Mediterranean coast, in the European Theater of World War II. It was bordered to the south by the North African Theater of Operations, US Army (NATOUSA), which later became the Mediterranean Theater of Operations (MTOUSA). The Asiatic-Pacific Theater, was the theater of operations of U.S. forces during World War II in the Pacific War during 1941–45. From mid-1942 until the end of the war in 1945, there were two U.S. operational commands in the Pacific. The Pacific Ocean Areas (POA), divided into the Central Pacific Area, the North Pacific Area and the South Pacific Area, were commanded by Admiral Chester W. Nimitz, Commander-in-Chief Pacific Ocean Areas. The South West Pacific Area (SWPA) was commanded by General Douglas MacArthur, Supreme Allied Commander South West Pacific Area. During 1945, the United States added the United States Strategic Air Forces in the Pacific, commanded by General Carl A. Spaatz. This section of the Timeline of United States history concerns events from 1930 to 1949. Murray Fletcher Pratt was an American writer of science fiction, fantasy and history. He is best known for his works on naval history and on the American Civil War and for fiction written with L. Sprague de Camp. The South-East Asian Theatre of World War II was the name given to the campaigns of the Pacific War in Burma, Ceylon, India, Thailand, the Philippines, Indochina, Malaya and Singapore. Conflict in this theatre began when the Empire of Japan invaded French Indochina in September 1940 and rose to a new level following the raid on Pearl Harbor, and simultaneous attacks on Hong Kong, the Philippines, Thailand, Singapore and Malaya on 7 and 8 December 1941. The main landing at Singora on the east side of the Isthmus of Kra preceded the bombing of Pearl Harbor by several hours. Action in the theatre officially ended on 9 September 1945. Siegfried Carl Alban Rumann billed as Sig Ruman, was a German-American character actor known for his portrayals of pompous and often stereotypically Teutonic officials or villains in more than 100 films. Gabriel Dell was an American actor and one of the members of what came to be known as the Dead End Kids, then later the East Side Kids and finally The Bowery Boys. War in Europe is a board wargame designed by Jim Dunnigan, and published by Simulations Publications (SPI) in 1976. It was an expansion of a previously published wargame, War in the East. In order to allow players to focus on the war in western Europe and North Africa, a "sub-game" was created known as War in the West. It was subsequently marketed separately from War in the East. It was known as one of the premier games in the category called monster game, needing several square feet of room for the nine maps and days or months to play. The South West Pacific theatre, during World War II, was a major theatre of the war between the Allies and the Axis. It included the Philippines, the Dutch East Indies, Borneo, Australia and its mandate Territory of New Guinea and the western part of the Solomon Islands. This area was defined by the Allied powers' South West Pacific Area (SWPA) command. The Pacific Ocean theater, during World War II, was a major theater of the war between the Allies and the Empire of Japan. It was defined by the Allied powers' Pacific Ocean Area command, which included most of the Pacific Ocean and its islands, while mainland Asia was excluded, as were the Philippines, the Dutch East Indies, Borneo, Australia, most of the Territory of New Guinea and the western part of the Solomon Islands. The Panzer Grenadier series of board wargames is Avalanche Press's series of World War II tactical land combat. The first game in the series was released in 2000. Between 1942 and 1945, during World War II, Walt Disney Productions was involved in the production of propaganda films for the U.S. government. The widespread familiarity of Disney's productions benefited the U.S. government in producing pro-American war propaganda in an effort to increase support for the war. Great Naval Battles is a series of computer games by Strategic Simulations which simulate combat between naval vessels. It consist of five separate games, four of which depict various phases of World War II. Each game combines a wider view of the action on a fleet scale, as well as controls for individual ships. SSI covered similar themes in another naval game, Fighting Steel, which was released afterwards, in 1999. 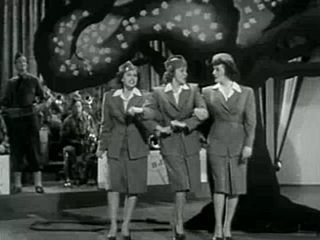 "Don't Sit Under the Apple Tree " is a popular song that was made famous by Glenn Miller and by the Andrews Sisters during World War II. Its lyrics are the words of two young lovers who pledge their fidelity while one of them is away serving in the war. Roy, Pinaki (2006) "The Stomach of a War: Perceiving Second World War through Keith Douglas's Poems". The Atlantic Critical Review Quarterly ( ISSN 0972-6373; ISBN 81-269-0747-9) 5(4), October–December 2006: 1-13. Roy, Pinaki (2011). "Here're the War poets: Keith Douglas and Other English Versifiers of the Second World War". The Atlantic Literary Review Quarterly ( ISSN 0972-3269, ISBN 978-81-269-1674-0)12 (4), October–December 2011: 23-36. Roy, Pinaki (2013). "Love in Times of War: Amorous English Poems of the Second World War". The Visva-Bharati Quarterly ( ISSN 0972-043X) 21 (3 & 4) and 22 (1 & 2), October 2012-September 2013: 142-55. Wood, Edward W. (2007). Worshipping the Myths of World War II: Reflections on America's Dedication to War. Potomac Books. ISBN 978-1-59797-163-8.